You never stop learning, as Comrade Aleks found while discovering Imago Mortis through their latest album 'LSD'. Vocalist Alex and drummer Felipe fill him in with some more detail. "There's a Russian proverb, probably it has a kind of analogue in other cultures, but its rough translation is "You live, you learn, you'll die as a fool anyway." Even being neck deep into all that's doom, I've somehow overlooked Imago Mortis. Formed in 1995, in Rio de Janeiro, the band hasn't stopped growing and developing, and, now, after many line-up changes and three previous full-length albums, they brought out new release 'LSD' in 2018. It's intricate and pompous Doom Metal with influences including Heavy Metal and Prog. 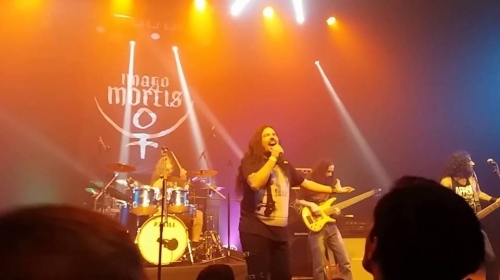 If you hadn't heard the name before, you can try some Imago Mortis tunes while reading this interview communally answered by the band's vocalist Alex Voorhees and new drummer Felipe Cassino." 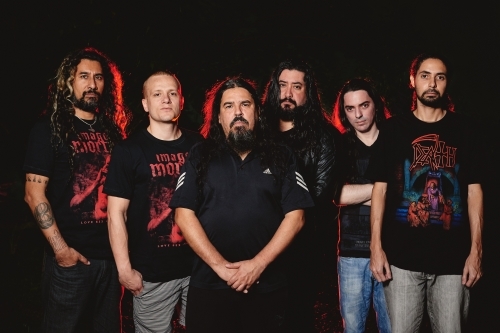 Imago Mortis current line-up: Felipe Cassino (Drums), Paulo Ricardo Silva (Bass), Alex Voorhees (Vox), Daemon Ross (Guitar), Charles Soulz (Keyboards), Rafael Rassan (Guitar). Photo: Fabio Cruz. Hail Imago Mortis! Thanks for an opportunity to spread the word about the band, how are you? What's happening in your camp? Hail bangers! Imago Mortis is focused on the release of the album LSD, already considered the album of the year here! The tour is getting well and now we want to release the album worldwide. The band was founded in 1995, what were your influences? Did you already have on your mind this sound you fulfilled in your debut album later? Good question. The previous influences still remain. Bands like Black Sabbath, Pink Floyd or Brazilian names as Chico Buarque, Egberto Gismonti are the roots of our music. Now we have our own unique sound, respecting our roots, for sure. So your first album 'Images From The Shady Gallery' was born in 1998. How did you compose this material? Do you have a main songwriter in the band? Alex Voorhees is a genius, the main songwriter and composer. But he joined the band in 1998, working together with the previous songwriters on the second album Vida. The previous ones were written by Fabio Lopes and Fabricio Barreto (the brothers, now they got their own band called Mensageiros do Vento) with help of Alex Guimarães (previous keyboard player). What are your memories about the first years of Imago Mortis? How often did you play in this period? The band performed at festivals and some small concerts too. We played as often we could, the usual for a new and unknown band. We always try to make our own music but we also played some covers too. Our audience wasn't so big but we started growing stronger. It's kind of a stereotype, but Rio de Janeiro is a city that isn't associated with Doom Metal at all. Was it difficult to find place to play there? Brazil is a young country, so we still have different cultures with strong influences here. Of course there are majorities with similar preferences, but you can find all kinds of music. That said, yes, Rio de Janeiro is a complicated city to organize doom metal events, especially nowadays. We have more invitations to play in the South of Brazil, in Minas Gerais and in the Northeast of Brazil. That was your first serious recording session as the band, how much time did you spend at the studio? Was it a difficult task? Far from it. Studio used to be a hard task for us at the beginning. Now it's my second home and I'm used to record and work with music production as well. I love it. The next album 'Vida: The Play Of Change' appeared in 2002, how do you see its features today? Still one of the greatest metal albums made in Brazil of all times. A classic. LSD is going to be the same way. How would you sum up Imago Mortis lyrical themes? What kind of topics do you feel suitable for the band's epic sound? The lyrics are based in philosophical themes, going from Plato to Freud and passing by other great philosophers as Descartes and Nietzsche. But our great source of inspiration is man, this creature that once was defined as "a being beholding death". The band appeared in a period when Doom Metal lost its weak "popularity", and the '00s was a kind of very slow rise for the band. Did you feel that back then? I do not think so. What happens now is that music has split and genres are concentrated in small niches. Our music floats from traditional heavy-metal to doom, to progressive and symphonic. I believe we have, however, our own audience and our focus is to increase our fan base. We need to grow to keep going on. What was your goal when you started to write third album 'Transcendental'? Did you aim to surpass your earlier recordings? Nope. Surpassing our earlier recordings was just the consequence because of the experience. It was the first switch of songwriters of the band. Transcendental was mainly written by me and – of course – sounds a little different from the previous one. With the last album we finally could achieve the best of two Imago's eras with more innovative music as well. We're going further. After a huge delay Imago Mortis returned in 2018 with new album 'LSD'. How did you spend this period between albums? What slowed you down? OMG, man. Long story, I can't resume it in few words. All I can say it's we have our reasons, actually. Too many personal problems and switch of band members as well. I took my time to study the subjects and write the songs as well. But finally we're here and the album is getting very well! What's the concept behind 'LSD'? The first inspiration was the Helen E. Fisher book Anatomy of Love - in which she addresses the biological and physiological question of love and passion. Based on Fisher's research, professor of anthropology at the University of Rutgers, she made a picture with many manifestations and phases of love and its relationships with different chemical substances on our body. I observed this phenomenon as well. So I decided to delve deeply into the subject - using also visions of philosophers as Nietzsche and Schopenhauer, who have already touched on the subject a few times. I noticed that there was much in common with both my visions, the work of the philosophers and of Helen Fisher. My own past relationships also worked as fuel for me, to write the songs, I also had enough experience, by the way (lol). How do you see the core differences between 'LSD' and the first album? Both are original and unique in their ways but I think LSD is a natural evolution of our music. We still keep some basic features too, you can notice it on the "A Farewell Kiss" song, that sounds like the first album. We got our links, we connect all previous stuff but the main difference is we're more progressive, complex and we're better musicians too. The band is stronger than ever! You've released the album on your own, without a label at your back. Why did you choose this way? Actually we licensed the album by the label Die Hard Records that printed some copies to sell over Brazil. Streaming and all digital stuff is controlled by the band, though. We'll keep it that way. If some label wants to work with us, we just deal the physical stuff, CD's, DVD's or vinyls. We prefer to keep controlling Spotify, YouTube and all digital platforms. I think it's better this way. Did the album attract the attention of people in South America? Did you feel you got recognition? Of course. LSD is unique and it's a very deep and very inspired album. If people look for in our music to be common place as most current doom metal bands, they'll be disappointed. We don't like to follow trends or sound as if expected. Our music is very complex. If you listen with open heart and mind, you will be surprised. By the way, have you tried to work with foreign promoters, labels and distributors to spread the Imago Mortis word outside your land? How often did you play abroad? Of course. We want to print copies and release our last album LSD on Europe, China, Japan, USA, everywhere. We'll contact some labels. But our deals never include digital stuff. The previous albums are also available and I think it's a very good deal for majors as well. If you work on Nuclear Blast, Century Media or other major, contact us. You can get more money cause Imago sells lol! Visit the Imago Mortis bandpage.